Mac Hay (center) with Robert Campbell and Marlene Betty, two seasonal workers he relies on at his seafood market. It’s shoulder season in New England. The weather is pleasant (when hurricanes aren’t blowing by), and the summertime crowds are gone, but there’s still a steady stream of visitors sipping wine on outdoor patios and booking tours to admire the fall foliage. On Cape Cod, September is the third-busiest month of the year. But business owners from the Cape to coastal Maine are still grappling with a labor shortage due to cuts and delays in the seasonal visas that they have relied on for years. The international student workers and local college kids who filled in many of the gaps over the summer are back in school, leaving some already exhausted business owners short-handed once again. And anxieties are already running high about next year, when further reductions could be in store. Business is good at Arnold’s Lobster and Clam Bar in Eastham, but owner Nate Nickerson has abandoned plans to expand the menu and has started closing on Wednesdays and Thursdays because he doesn’t have enough help. In Phippsburg, Maine, the closure of two local restaurants — which had to shut down in August when their high school workers go back to school — meant approximately 100 extra diners flooded into the nearby Sebasco Harbor Resort . Proprietor Bob Smith didn’t have enough bodies to cover the rush last month, and his staff was overwhelmed. Smith even felt bad leaving for a few days recently to attend a lodging association meeting, at which the worker shortage was a hot topic. And in the future, there could be far fewer. The Trump administration is reportedly considering significant reductions to the cultural exchange visa program, which includes international student workers. Coupled with foreign worker restrictions, that could spell disaster for some businesses. Some business owners talk of retiring early, others say they might have to cut back hours and services even more than they did this year or pay more overtime. Expansion plans are being scrapped, and some worry that commercial property values could plummet. And the hiring of undocumented workers, already on the rise this year, would surely increase, some say. The crisis was triggered last fall, when Congress did not reauthorize an exemption that removes returning foreign workers from the annual H-2B visa cap of 66,000: 33,000 in the summer and 33,000 in the winter. And with demand high and supply low, the limit for the summer season was reached in mid-March, earlier than ever before. When business owners protested, saying their hotels and restaurants were suffering, the Department of Homeland Security lifted the cap in July — halfway through the season — releasing an additional 15,000 visas for businesses that could prove they would be irreparably harmed and at risk of closing their doors if they didn’t get more workers. But many businesses didn’t apply, knowing the workers wouldn’t arrive until August, and instead beefed up their staff of foreign college students who come on J-1 cultural exchange visas, which weren’t impacted. Now those visas are under fire, too, as the Trump administration reportedly considers a major reduction to those programs — which include more than 100,000 summer workers a year— as part of the “Buy American and Hire American” executive order. Local tourist destinations have come to rely heavily on foreign workers, as Americans increasingly shun low-paid seasonal service work, especially in places where the cost of housing is high. A low unemployment rate and a raft of job openings mean many Americans have other options. Business owners stress that they would hire American workers if they could. The H-2B program requires them to advertise jobs locally first, but US citizens rarely apply. 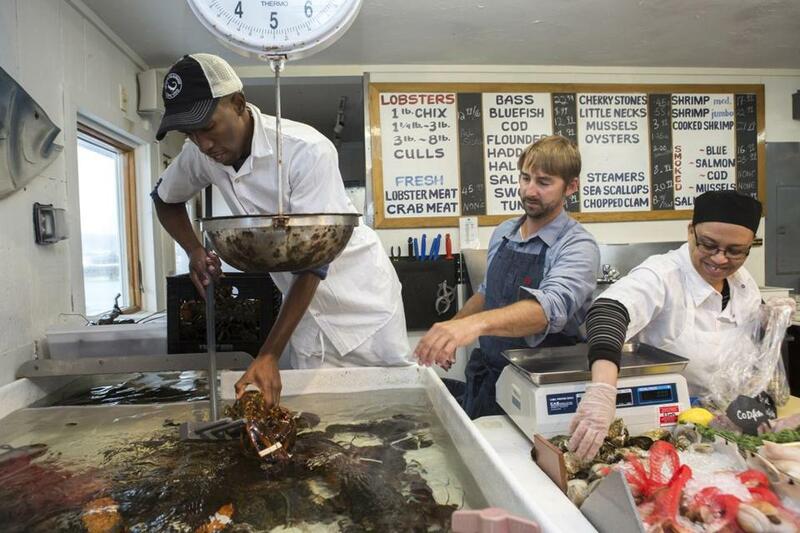 On the Cape and Islands, as many as 9,000 workers in a seasonal workforce of up to 20,000 are foreign workers in the H-2B and J-1 programs, said Wendy Northcross, president of the Cape Cod Chamber of Commerce. Arnold’s, in Eastham, normally opens in mid-May, because businesses can apply for H-2B workers only 90 days before their start date. But Nickerson is considering opening earlier next year so that he can apply for workers before the cap is hit. This would cost him even more money, as there aren’t many tourists coming in for lobster rolls and clams in April. Business has slowed considerably at Fusaro’s Italian restaurant on Nantucket since the end of August, and that’s fine by owner Tom Fusaro. All summer, he had no “bench” to go to if a worker didn’t show, and he spent his nights apologizing to diners for the wait. Several bills have been filed in Congress to ease the visa squeeze, including one reintroduced by Representative Bill Keating, whose district includes Cape Cod and the Islands, to exempt returning workers from the H-2B cap. The Cape Cod Chamber of Commerce has started a pilot program to link unemployed people in public housing to seasonal jobs in the region, but it is proving to be challenging, Northcross said, because of people’s child-care needs and a general reluctance to take low-wage kitchen jobs. The hope was to fill 50 open positions by this month, but so far no matches have been made. Meanwhile, business owners and managers, some of whom haven’t had a day off all summer, are already scrambling to make next year work. They are partnering with winter resorts in an attempt to get workers who are already in the country and don’t have to reapply for visas, and lobbying Congress and writing letters to President Trump. Some are looking at US territories such as Puerto Rico and the Virgin Islands to find workers who don’t require visas. Hay, the owner of Mac’s Seafood, had to close his fish market in Truro this year, in part because he was unable to staff it. He has put expansion plans on hold, and he can feel the tension mounting among business owners on the Cape as they all compete for the same pool of workers. Hay hired Campbell, a seasonal worker of Jamaica. Bud Noyes is already among those first in line. He opens JT’s Seafood Restaurant in Brewster on April 1 for the sole purpose of securing H-2B workers. About a third of his workforce is foreign, including his Jamaican kitchen staff. But Noyes, who is 62 and contemplating retiring earlier than planned because of the labor debacle, never knows how many workers he’s getting until early March, a waiting game he calls a nightmare. And this year, with talk of J-1s going away, he’s more stressed than usual. Katie Johnston can be reached at katie.johnston@globe.com . Follow her on Twitter @ktkjohnston.